You can listen to The Living Experiment on these platforms. While you're at it, be sure to subscribe. That way, you'll get new episodes from Dallas and Pilar every Tuesday. Want to contact us? Use this form or contact us on social media to let us know about how your experiments are going. Use #TheLivingExperiment on Facebook or Instagram to share your experiments with us. YES! 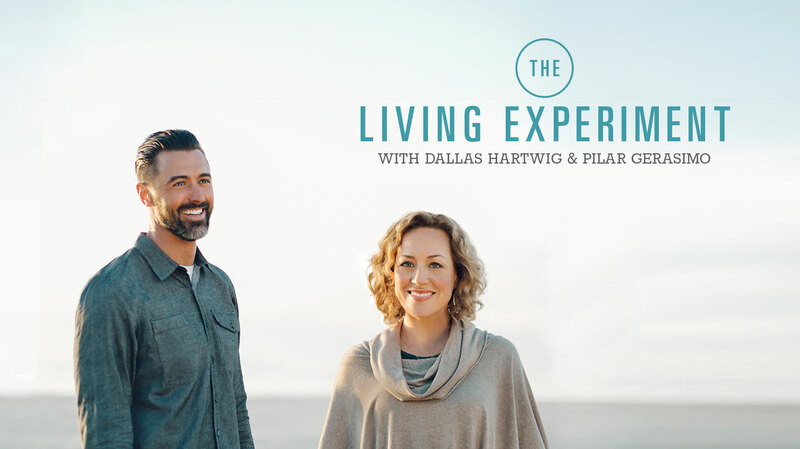 I’m interested in a retreat with Dallas and Pilar! Subscribe to our mailing list and receive Pilar's Top 10 Tips on The Art of Being Healthy in an Unhealthy World. Feeling a call to declutter your space, but not sure how to go about it? In this special guest episode (a follow up to our “Clutter” installment), Pilar chats with her sister Andrea, a professional Feng Shui and decluttering expert, about the techniques and strategies she uses to help her clients create order, sanity, and beauty where chaos once reigned. This is one set of tricks you absolutely CAN try at home. On this week’s special guest episode of The Living Experiment, we’re talking about Decluttering. This is a follow-up on our “Clutter” episode from earlier in the season, in which Pilar promised to consult her decluttering expert and Feng Shui-certified sister, Andrea, for some of her down-and-dirty practical tips. Here, Andrea shares essential guidance on how to turbo-charge your decluttering projects, and how to avoid getting bogged down or overwhelmed in the process. Andrea has been a pro declutterer for decades. She regularly consults and teaches workshops on the topic, and she’s the featured expert in an award-winning article and video series called “Order Out of Chaos” that’s featured in Experience Life magazine. Blending Andrea’s philosophy, strategy, helpful techniques, and real-life examples, we set out to help you take charge of the clutter in your own world. 1) Using Andrea’s “multi-bin” technique, declutter a small area (like an overstuffed drawer, cupboard, or your car) that has been annoying you. 2) Walk around your house with “fresh eyes,” looking at places clutter has accumulated, or where “receptive space” would be appealing. Make a list of the areas that are asking for attention and consider scheduling some time to address them. 3) Read or watch one or more installments of Andrea’s “Order Out of Chaos” series from Experience Life magazine (see list of individual installments, below). 4) Andrea’s recommended experiment: Block off an entire day in your schedule for a “you” day (to use for decluttering or resting or whatever you like) — then notice what “comes up” that inclines you to give up that day or that impinges on it in some way. Consider how “schedule clutter” works much like physical clutter in your life, and how the two are connected. Get your $19.95 annual print subscription to Experience Life magazine — a discounted rate for our podcast listeners! Or, sign up for one or more of their free e-newsletters! Have you told your friends and family about The Living Experiment? If you dig the podcast, please share it! Every recommendation from you means a lot! We’d also love to have you connect with us on Facebook. Tell us about your experiments, and share your thoughts, stories and reflections there. Sign up for The Living Experiment newsletter so you can stay up to date with us and receive notifications when new episodes are released. Subscribe to The Living Experiment on Apple Podcasts to have fresh episodes delivered to your podcast feed each week.